Just prior to Canadian Music Week, which took place in Toronto from May 1 to 10, the fine gentlemen from Palaye Royale agreed to do a quick Q&A. 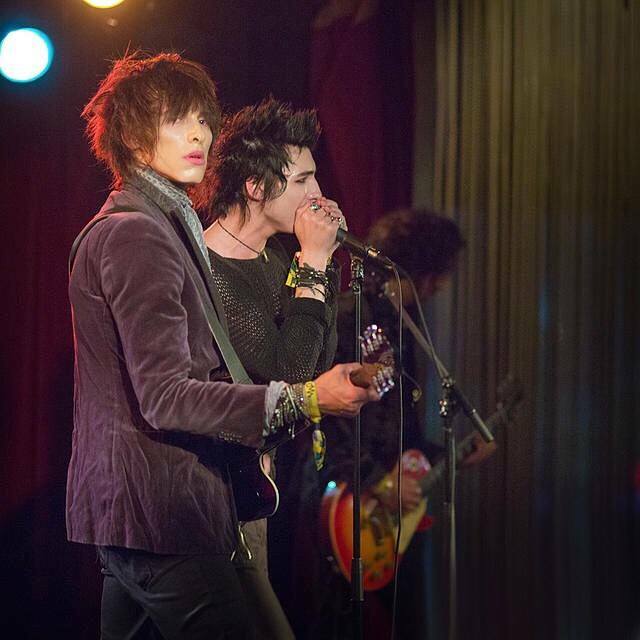 If you don’t know who Palaye Royale is, here’s a quick primer. Founded in 2011, the trio is currently based out of Las Vegas and composed of Remington Leith, Sebastian Danzig, and Emerson Barrett, who have dual Canadian-American citizenship. In their initial years as a band, they quickly developed a following for their “fashion-art rock”, a dramatic and cinematic take on rock ‘n roll as well as combining cinematography with their music. In short, their approach is to combine the audio with the visual to create a full sensory experience for audiences. In their four years, the band has produced a couple of singles and an EP, The Ends Beginning. In addition, they’ve released a handful of music videos and several “behind-the-scenes” videos about life in a band, which can be found on their YouTube channel. The self-promotional strategy has paid off and in big ways. First, their single, the extremely catchy “Get Higher”, was featured on a Samsung Galaxy commerical. Second, they created music history – well, MTV history – by being the first unsigned band to win the MTV March Madness Musical competition in 2014. To raise the trophy, they defeated Vampire Weekend, Coldplay, Bastille, Tokio Hotel, We Are in the Crowd, and then Linkin Park in the finale. Those are some heavy hitters they’ve toppled along the way. But the hits keep on coming for the young trio. They’re about to produce a rock-umentary series to document their upbringing and work to get where they are today. Their on the verge of signing with a label. And earlier this year, they teamed up with fashion designers Brian Wolk & Claudie Morais and performed at their Spring ’15 runway collection. Through social media and with an aggressive marketing campaign, Leith, Danzig, and Barrett have carved out a name for themselves, rubbing shoulders with the rich and famous. But at the heart of all the action and the personae they have created lie three young men who want to make a positive influence on people and to create music that pushes boundaries. They just finished participating in the multi-week High School Nation tour, which invites musicians to visit public schools across the US and perform in front of kids who normally wouldn’t get the chance to attend a rock show or a huge spectacle. In addition, during the tour, kids get one-on-one time with the musicians, talking or learning to play an instrument. The trio will also record an album this year. They’ve enlisted the support of producer Nick Launay, who has worked with influential indie music acts like Nick Cave, Arcade Fire, and The Yeah Yeah Yeahs. The young men mean business, and I chatted quickly with them to get to know them better, their expectations of Canadian Music Week, and food in Las Vegas (because I like food). Hi guys. How’s it going? Hello, we are all doing great at the moment we are out on The High School Nation Spring Tour! That’s really cool. Let’s introduce you to those who don’t know who you are. So who’s who and who does what? I am Remington Leith, the frontman of the fashion-art rock band Palaye Royale. Sebastian Danzig is the guitarist and organist, and Emerson Barrett is the drummer. It’s great to meet you guys. I have to ask this question because I don’t know the answer to it. What exactly is fashion-art rock? According to Emerson, fashion-art rock is a cauterization for stretching the bounds of just music, exploring the realms of fashion, cinema, art, poetry, and philosophy. But, at the end of the day, it’s just rock and roll. How did you guys form the band and then focus on creating fashion-art rock? The three of us have a similar outlook on the state of music in general. Forming from our boredom with everything that is going on in the music scene now, none of us see anything substantial. So we took it upon ourselves to continue the roots of rock and roll and form it into a revolution for the modern generation. Nice, I know you’ve collaborated with designers Brian Wolk and Claudie Morais, but have you performed at the annual Las Vegas fashion show or any plans to? Palaye Royale will be performing at a few key fashion shows for fashion week in New York City in September with Gen Art. That’s all that is planned for now on this front. How did you guys get nominated to be part of the MTV March Madness Musical competition? And more importantly, what was your reaction when you beat out Linkin Park to win the 2014 title and become the first unsigned band to win the competition? How much has changed for you since that accomplishment? Right now, we’re touring and have had the opportunity to perform in front of roughly 100,000 high school students in a little over a month. Then we will be heading into the studio to record our debut album. You remain unsigned. Any plans to sign with a label and what things are looking for before you decide on one? We have remained independent for the reason of staying true to artist integrity. Allowing ourselves to grow and form in a natural way instead of being thrown to the wolves and not coming out like most artists today. Our plan is to sign to a label and we are going through that process right now. You’ll be at Canadian Music Week in early May. What do you have planned to do while there, including performances and things you wish to see personally? We fly in after our show in Las Vegas on the midnight flight, get into Toronto about 8am, try to have breakfast with our families, off to do a day of press at Canadian Music Week, and then soundcheck at 5pm at the Hard Rock Cafe. We’ll then do some more interviews, have a meal in the hotel, try to take a nap before the show, and then back to the venue for our showcase at midnight. Hang out till the wee hours of the morning with our family and friends, and then we jump on a plane at 11am back to the States to resume the High School Nation tour in Las Vegas! An exciting but crazy 26 hours of rock and roll! Forming from our boredom with everything that is going on in the music scene now, none of us see anything substantial. So we took it upon ourselves to continue the roots of rock and roll and form it into a revolution for the modern generation. That’s crazy. Ok, some less stressful, non-music questions, all food related since Las Vegas is emerging as a must-visit, foodie destination. Remington says he’s not Gordon Ramsey, so we should ask him. He also says he didn’t know the Las Vegas is an emerging food destination. That’s o.k. No one needs to be Gordon Ramsey or Wolfgang Puck to enjoy good food. First question, is In-and-Out Burger really that good? In-and-Out Burger is the Best in Las Vegas! Second, have you ever had poutine and, if not, will plan to try it while in Toronto. We will be lucky if we do have time to eat outside the venue with the crazy schedule! Toronto is one of our favorite places, and we are looking forward to go back and have a day off to enjoy the city with our family and friends. Third, what are some great places to eat in Vegas not located in a casino? My friend took me to Raku, and I loved it. Final question, you guys are still quite young, but how would you define success in your careers? As individuals? We want to instill into the youth a sense of culture in the form of arts. A mass revolution is our definition of success! Thanks so much for your time! Have a great time in Toronto.